One of the ways we’re working on building feminist community is creating spaces online where we can connect — and sometimes public social media platforms aren’t the best way to do that! That’s one reason we’ve got a Slack community — with channels for general discussion, event updates and just random fun. Why do we have Slack when there’s already so many social media platforms out there? Well, we don’t know about you, but we sure do get overwhelmed by the ocean of content and notifications on Facebook, Twitter, Instagram, LinkedIn, etc. etc. etc. 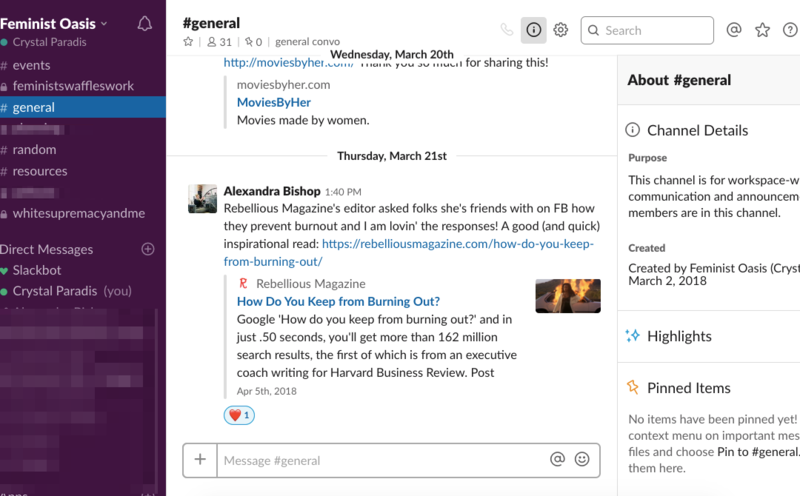 — Slack is a channel typically used for work or collaborative teams, so hopefully it’s a network that you turn notifications ON for and know that you won’t be inundated with every update from every org and distant relative you are connected to! How to Set Up Slack to be Actually Useful! Here’s a few handy links to help articles from Slack that will help you set up the channel to work for you. Download the Slack mobile app — And turn on notifications or at least the notification badge so that you’ll be aware of conversations and messages coming to you! Turn on + customize notifications — We’ll leave it up to your digital hygiene preferences, but whether it’s push notifications, email notifications or app/desktop notifications, make sure you’re getting the ping when folks are pinging you! You can also adjust the TYPE of notifications you get, so if you only want notifications when you’re directly messaged or from certain channels (and not others — you can mute certain channels) you can edit ALL of those preferences (here’s how). Know your channels — We’ve got channels for categories of convo — #events for upcoming event info (feel free to share about YOUR events or events you think we’d be interested in in that channel, too! It’s not just for Feminist Oasis events! ); #random for fun/funny/other news and content that you think the group will find of interest; #general for general conversation related to Feminist Oasis or feminist topics of discussion; #feministswaffleswork for our coworking cohort to share tips and ask/answer advice for small business, entrepreneur and freelancer experiences (let us know if you’ve attended a session and haven’t been invited to that channel yet! ), etc. Keep your messages in the right channel, and folks signed up for notifications to that topic area will be alerted to your messages! Beyond the basics above, here are a couple of solid tips to keep Slack pleasant and streamlined for all! More Reactions: Use emoji reactions to signal support or recognition for a comment without starting a sub-thread. This saves others in the channel from excessive notifications from comments/replies that can be simple “thumbs up” or similar reactions, if you’re just acknowledging a comment. If, like us, you’re only using Slack for a few key projects that you’re actively involved in, and you hold to the best practices above, you can feel comfortable turning on notifications and know that this is a community you can trust with that notification power! We also create private channels for specific requested topics, too — for example, we started one for discussing the “White Supremacy and Me” workbook back in February, and invited a few folks we knew were working through that during that month. Want in on that group so you can discuss it without getting trolled by strangers? Ask us! If there’s another topic you’d like us to create a private or public channel for, please let us know! And since we add new channels occasionally, be sure to check the full list of channels occasionally to see other channels you might like to join that you weren’t automatically added to when we invited you initially. Got any questions about our Slack channel or suggestions for other uses? Please let us know in the comments or contact us anytime!